Managing a departure with a performance limited takeoff weight can be one of the more challenging tasks that face an Airline Captain today. It all sounds simple enough in theory. Based on the Airport/Runway, Ambient Weather Conditions and Aircraft, a computer will spit out – down to the kilogram – how much weight you’re allowed to lift off the runway. From this number a passenger/cargo and fuel load is determined – and off you go. But all is not as it seems. – the temperature above which I can expect to have to reduce below maximum certified takeoff weight (351,534 Kg in the 777-300ER). This is certainly not an operational document – indeed it’s always out of date because I only update it infrequently – but it gives me an approximate idea long before I get to the plane as to what sort of limits I might encounter on the departure. A heads up, so to speak. 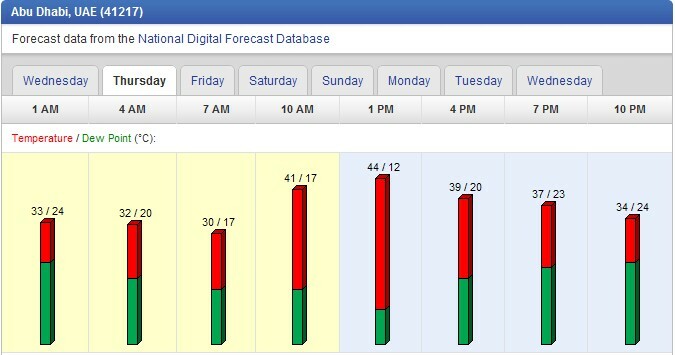 And with temperatures in Abu Dhabi (OMAA) reaching into the 40’s – you can see where the problems begin. Interestingly, in my previous airline, I rarely encountered performance limited takeoff’s – which could be considered a regular event at our home airfield of Dubai. The most common place for me personally was actually Melbourne (YMML/MEL) when a heavy departure combined with a light breeze from the north would leave you with the poor man’s choice of a departure to the north into the wind over the climbing terrain – or a departure to the south over nice flat suburbs leading to the bay – with a tailwind. Combine temperatures above 30 degrees with 10 knots from the north and with the fickleness of the wind, the optimum solution would flick back and forth between the two opposite runways. When the wind from the north was feeble enough (typically less than 10 knots) to embolden you for a tailwind departure to the south, often you’d sit at the holding point for 45 minutes waiting for a space in the traffic pattern before you could go – all but negating the advantage of the southerly departure. But I digress. Our little saga begins in Abu Dhabi (OMAA/AUH) on our fourth and last day in the UAE, at 9am. We have arrived early at Etihad briefing where we were usually provided with the flight plan and other documentation on arrival. We were a little early but even so the flight plan was already 30 minutes late with no indication as to when it would arrive. Several fruitless phone calls later I implemented the Paul McCartney solution to airline problem solving – I just Let It Be. The plan eventually arrived and we noted that we were (unsurprisingly) performance limited for Takeoff. Instead of our certified 351.535 Tons – today’s takeoff was planned at 342.036 Tons, which included 122.5 tons of fuel – the minimum required to get the aircraft safety from Abu Dhabi back to Sydney. I looked into my Android phone and found the current temp at OMAA airport was 36 degrees, and a ten knot headwind was blowing down the active runway. A departure 90 minutes from now at 40 degrees seemed conservative enough – we reviewed the documentation, briefed the crew and headed for the aircraft. Apart from our departure threat – there were two jet streams to contend with – one a headwind that we were to cross just after entering the Sea of Oman; the second we would follow like a ski run across the Southern Indian Ocean and right across Australia. This 160 knot (300 kph) tailwind was responsible for our shorter flight time (12:30 hours) but could well bring some moderate or worse turbulence. Finally Sydney was forecasting passing showers with a cloud base as low as 800 ft. Nothing un-toward but since our dispatch was to be with minimum fuel, I was already considering way to increase our fuel load – nothing gives you more options like additional fuel. We arrived at the aircraft at about 60 minutes before departure. Traditionally I offer the Flight Management Computer setup to one of the Relief First Officers, but I realised time was going to be tight (how little I knew at that point) and we stuck to standard SOPs. Gareth and I did our setup, Ben headed out into the sauna for the aircraft walk around, and Tian completed safety and security checks for us, as well as kick starting the laptops, pulling out the charts, preparing the flight docs and the dozen or so other jobs that our unsung relief crew perform on every flight to assist the primary crew in getting the plane moving. Fairly soon after arriving on the flight deck, we were approached by the Dispatcher Misha – who wanted an increase in takeoff weight. The weight dictated by Ops required her to offload an entire pallet of approximately 4 tons for a 900 kg overload. There’s generally no time to split pallets this close to departure so unless you can get the whole thing on, the whole thing has to come off. I told her it might be possible, but we’d not be able to confirm for 15 minutes or so. 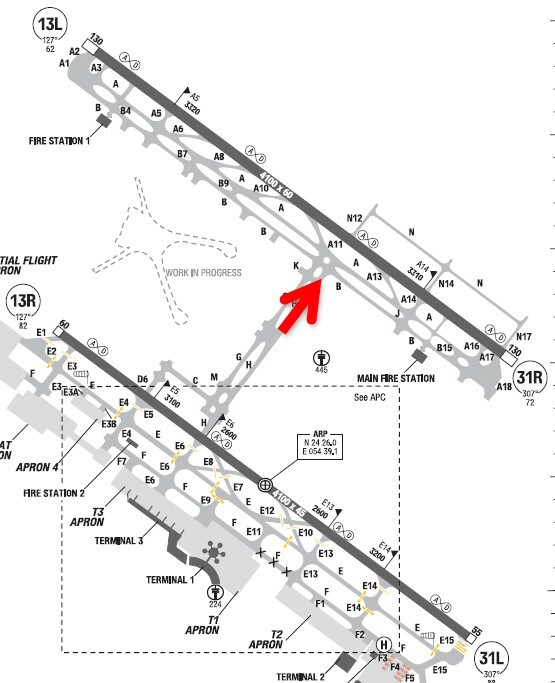 With the takeoff on our minds and Misha’s request in our ears, we reviewed the latest ATIS and asked for current temp/wind from the Control Tower. Often the ATIS can be a little old and the Tower often has useful gen on the history and future of winds and temps – they see the same thing day after day after all, particularly somewhere highly predictable like Abu Dhabi. In this case – both of the latter two suppositions were incorrect. The ATIS was accurate and the Tower not particularly helpful. The temperature was now 37 degrees and the wind 10 knots down the runway. We were approaching 40 minutes to departure and passenger boarding well underway. Gareth and I pooled our 20 years of Middle East experience and decided to plan on a temperature of 40 degrees and 5 knots of headwind, which felt conservative enough. This gave us an additional 3 tons to play with. Pushback time was 10:55 local and despite a long taxi to the far runway (closest runway closed) – we were confident it would be ok. We gave Misha her additional ton and ourselves an extra ton of fuel, leaving us a margin of a final ton under our hopefully conservative takeoff performance calculations. We then continued on with our preparations. As all airline pilots know – this is make or break it time. Load control (in our case, Misha the dispatcher) provide you with the final weight of the aircraft and based on this you determine your fuel load. Misha had increased the aircraft weight by 1.1 tons (cheeky) to which we added our extra ton of fuel – plus the 500 kg’s of fuel required to carry Misha’s extra ton. We checked the ATIS weather again – still 37 degrees and 1o knots of headwind – and Gareth and I separately calculated Zero Fuel Weight, Takeoff Weight, Landing Weight and Fuel At Destination – and then compared them to each other and the structural/performance limitations to ensure calculation accuracy and practical legality. Then we gave the relevant figures to Misha, advised the refueller of our final fuel requirement, and rolled on into the straight run towards pushback and departure. 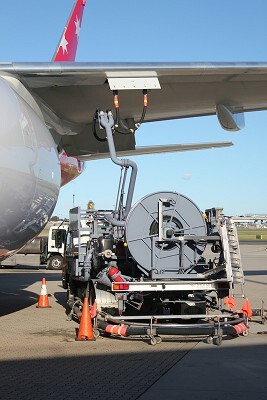 Pretty quickly the refueller completed our final fuel and disconnected the refuelling truck. We were almost ready to go. This is when things started to wrong. Typically up to this point you have refuelled to 3 tons below the fuel you’re expecting to need. That way if the final weight comes in under what’s expected – there’s often a variance like this – you can reduce your final fuel order and not carry extra fuel un-necessarily. Changes in weight have a significant impact on long haul flights – for our flight a decreased of the aircraft weight of 1000Kg reduces the requireed fuel by 450Kg. Given the price of fuel and the economics of operating an airline today – not carrying extraneous fuel is a significant impact on the economics of the operation when taken across all the flights operated by the airline. Over the next thirty minutes we watched as the wind dropped off to 5 knots with a variable direction such that we could not count on any head wind at all. The temperature meanwhile climbed from 37 degrees to 38, 39, 40 – and 41. In these conditions, every degree of temperature rise reduces the performance limited takeoff weight by anything from 1500-3000Kg. Each knot of wind loss reduces takeoff performance by approximately a 200 kg change. Ask me how I know this. By the time the cargo and passengers were fully loaded, the paperwork ready to go and all but the last passenger and cargo door closed – we were now 8 tons overweight for takeoff. We reviewed our calculations, looked at alternate runways, did some what-if’s with the wind. We were already planning to run the air-conditioning off the auxiliary power unit (APU) to maximise thrust from the engines – there was literally nothing further we could do. I found Misha and discussed the situation with her. We decided to commence offload of our freight. There were issues here – some of the freight was high priority, there were going to be balance problems. We had about 10 staff on board the aircraft who could also be offloaded. Thus the offload would be in three stages – Freight, High Priority Freight, Staff & Staff Bags (the last two not necessarily in that order). While this kept Misha busy – Gareth, Ben, Tian and I now had to determine what conditions we were going to use for departure – and therefore what limiting weight was going to be imposed on the cargo load. As we struggled with our crystal ball each time we picked a scenario that seemed conservative, we were looking at offload a portion of our revenue passenger’s bags – and perhaps some of the passengers – to deal with the situation. At one point Gareth looks at me and says “I’ll ask the tower what the maximum temperature will be today.” Right. Despite the dizzying force of my subsequent withering gaze of disdain, eternal optimist that he is he jumped on the radio and asked Ground Control what the maximum temperature was going to be. “Forty Two Degrees, Insha’Allah, Captain.“, was the answer. It’s 41 outside at this point, and about 12pm local time. Gareth looked at me encouragingly – 42 we can cope with. I passed my hand across the flight deck through space and time and intoned the words “It will not go above 42 degrees.” After a lack of reaction from Gareth, I followed up with “The force gives power over weak minds, Luke.” Gareth’s turn for a withering gaze. 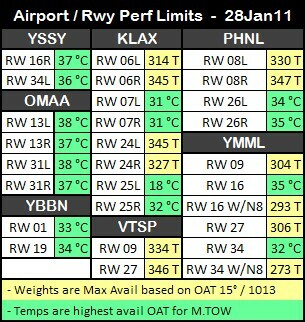 Let me finish off this little bit with a picture of OMAA Airport Temperatures for the day in question. That tall bar in the middle – that’s when we took off. I must point out here that our problem was not just the weight of the freight and passengers – but also the fuel. We had calculated a required fuel load based on Zero Fuel Weight ZFW (aircraft + load) of 219.6 Tons. We were now busy offloading cargo to achieve a ZFW of 209.1. Thus the fuel we required could similarly be dropped by about 6 tons – except that it was already on board the aircraft. If we got to the point where we’d offloaded the cargo and the anticipated conditions were such that we still could not take off – we would have to consider de-fuelling. – Typically the truck does not have the facility to pump fuel off – the aircraft needs to do the pumping and generally manages about 125 kg / minute. – The fuel cannot usually be used by another airline and must be kept for your airline the next time you refuel. To say the re-fueller/engineer was disenchanted with the concept of de-fuelling our aircraft was an understatement. He seemed a fairly taciturn individual right up to that point where I asked him about de-fuelling. From that point on he just kept smiling at me. We hadn’t forgotten our passengers through all this. During the delay I made two Passenger Address’s explaining situation and updating as we went along; the crew and the entertainment system kept the passengers busy and satisfied as best could be achieved; at one point as we waited with nothing to do I walked through the cabin talking to passengers answering questions. There were issues with connections and certainly some disgruntled passengers but all told our Cabin Crew worked really hard on service recovery. I stood near the door after the end of the flight and for the most part got smiles from our glad to be in Sydney passengers. As an aside, I also considered offloading some water. 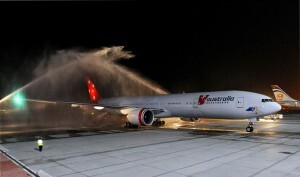 The aircraft carries about 1.5 tons of potable water. Typically on a long full flight there’s almost a ton left. I’ve used this technique in the past to carry an additional passenger or two when we’ve had empty seats but we’ve been performance limited. Again in this case – it seemed more practical and less risk to burn the fuel on taxi. I may never be allowed to vote Green again. 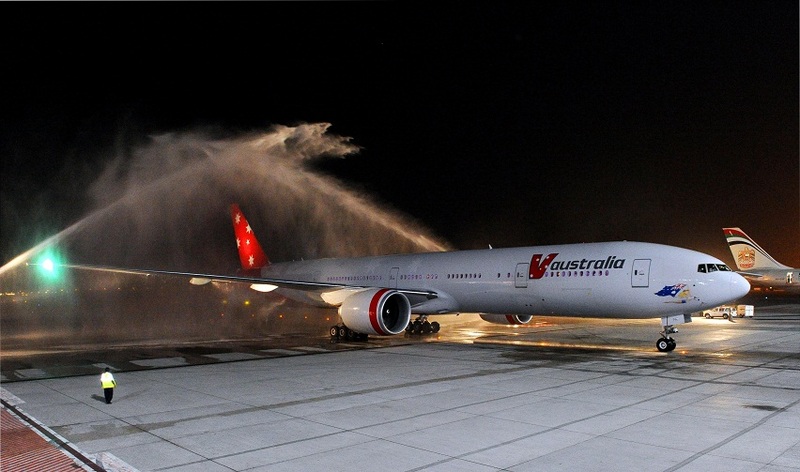 As the cargo had come off – including some re-arranging of passenger baggage from the Aft to Forward hold for balance purposes – the temperature was increasing still. The wind was still reported as 5 knots variable, but also “Becoming” a 6 knot wind from the other direction. The sea breeze was kicking in, resulting in a Northerly that would force a change of runway (which didn’t help performance) but a potential increase in headwind component. We were now 90 minutes passed our scheduled departure time – it was 12:30 and we were still not at the peak heat of the day. Misha had confused us several times with a varying range of Zero Fuel Weights depending on what was offloaded and what was kept. I couldn’t blame her – we had flight plans and takeoff calculations flying around the flight deck like no man’s business. Misha confirmed that at ZFW 209.1 we had all pax (staff and revenue) and their bags on board. No freight – including the high priority freight. Based on the amount of fuel still on board we were now – and depending on which set of imaginary numbers representing the temperature and wind we’d see at the runway – at least 1500 kg overweight still. I decided we’d push back and taxi out. If the wind had not picked up producing a headwind, we would wait somewhere and burn off the ton of fuel. 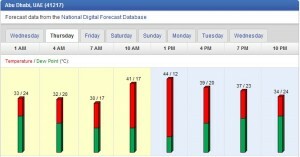 If the temperature increased, we would need to burn more. Of course nothing is that simple. Now that we were no longer a flight in quandry, but a flight trying to push back – the real world intrudes on our flight once again. There was a now disparity in the passenger numbers to sort out, paperwork to finish, a loadsheet to chase from Ops, a NOTOC to revise (no hazardous cargo onboard anymore), passengers to update (who for some reason would not take their seats) – and after two hours of a quiet, Abu Dhabi airport decides this was the time to ramp up activity. We sat on stand, fully ready to go for an additional 15 minutes waiting for push back. Because of a runway closure – it was a long taxi out to our departure runway. As we finally pushed back and started engines, I could hear Ben behind me checking the ATIS airport weather. I snuck a glance back – Not good. No wind and the temperature was now 43 degrees. If it went to 44 without a wind shift we’d be parked by the runway for at least an hour, burning through fuel. Another consideration was the APU to Pack takeoff. The procedure was designed to be enacted prior to pushback and once engines were started, one airconditioning pack would shut down and the other would run off the APU until after takeoff. Single Pack combined with our long taxi would result in a very warm cabin. Thus we would have to disable the APU to pack for a while and the re-engage it approaching the runway, re-entering our takeoff performance calculations as as we did so. Less than ideal. But not such an obstacle really, since we were taxi-ing out with no clear idea of which runway we would depart from, what the temperature and wind would be, and how long it would be before we could go. Everything would need to be done at the holding point in the end. Hopes and dreams were all we had really. Approaching the intersection at which we would have to choose a runway – we contacted Tower for an update on winds and temps. The wind had now swung to favour the other runway. We’d checked figures for RW31R but it hadn’t helped quite enough. However the combination of runway and headwind was helping. We turned right and continued along the inner taxiway – leaving the outer for aircraft that actually could takeoff. Once halted clear of the runway, we made the necessary aircraft and flight management computer changes for the new runway, updated the departure briefing, and asked again about the wind. Success – we calculated the figures and our limiting takeoff weight exactly matched our current aircraft weight. We expedited onto the runway and took off for Sydney. With all the additional fuel on board, we contact Ops and gained approval to increase speed and burn some of it – we had literally dozens and dozens of passengers with connections to all over Australia. We kept an eye on the weather in Sydney (which was a waste of time because it only degenerated to Rain Showers and a 600 ft cloud base once we’d commenced descent) and tore through time and space at Mach .855 most of the way (I’ve done Mach 86-88 on the 7773ER – but that requires a LOT of fuel, which even we didn’t have). Having shaved perhaps 40 minutes off the flight time, we then held for 35 minutes on the descent (round and round and round) and flew at minimum speed for the rest of the way to the runway. Gareth and I discussed this at length, and I’ve been thinking about it ever since. I’m still hesitant to accept at ETD-00:30 or even ETD-00:60 that it’s reasonable/practical to plan on a 5 or more degree temperature rise over the next 30/60 minutes. Each degree of temperature you’re conservative on (read wrong about) means 1 or 2 tons of revenue cargo not carried. By the nature of the situation, you have to be conservative – else you end up in the situation we found ourselves. Certainly the next time (Monday 22nd August – anyone want to change their travel plans now?) I’ll be far more reticent to accept a load anywhere near what we calculate to be the current or likely limit at takeoff. However, temporary gun-shyness does not an operational plan make. I know the situation is being reviewed by Flight Ops and I expect some kind of recommendation will be made shortly. It gets hot in Abu Dhabi in the Summer. Between the hours of 11:00-13:00 you have to plan on a continually increasing temperature, perhaps even precipitously so. Don’t count on the wind in these conditions. Be proactive about cargo offload. De-Fuelling is not an option to keep in your back pocket – it’s an absolute last resort that may not even be there when you go to use it. If you think you’re likely to need it – get it arranged early. Sometimes you have to decide, sometimes you have to decide early, and operational efficiency and the profit margin need to take a second place to the requirement to get the job done. Looking forward to the comments on this one.